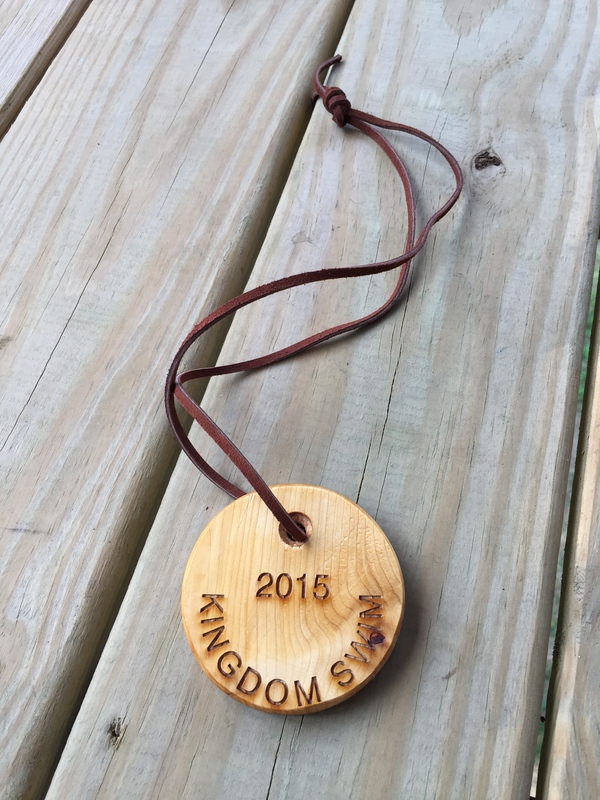 This entry was posted on August 9, 2015, in Open Water and tagged Border Buster swim, Katy Dooley, Kingdom Swim, open water swim kayak support, Phil White. Bookmark the permalink. A year ago this weekend, I took to the waters of Lake Zurich, swimming 16.4 miles in what was my longest swim to date. A wonderful event, and incredible time for my entire family, it’s felt hard to follow up. Switzerland. Beautiful water. Amazing fellow swimmers. Perfect conditions. 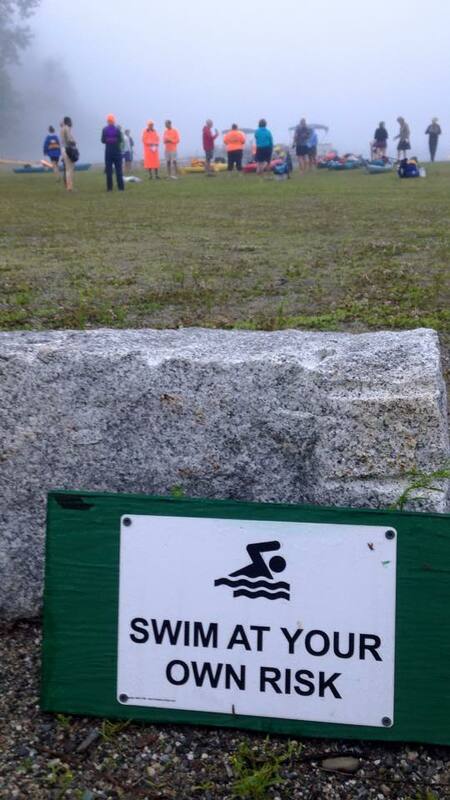 Really, a perfect marathon swim event for me. As I mentioned in a recent post, in the last few months, I’ve also started to change the way I think about this swimming thing, and to wonder if organized group swims are really what I want to be doing. 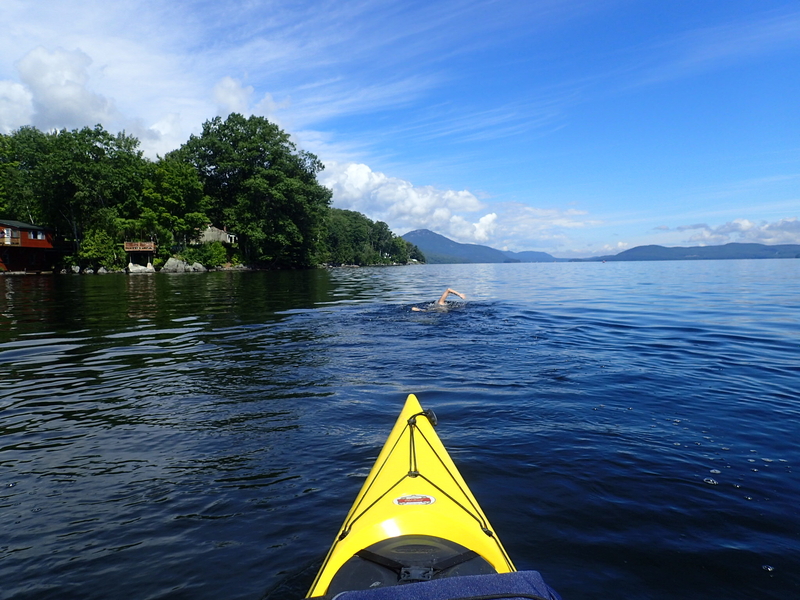 A few weeks ago I had to a chance to test that as, I did my my most recent long one, a 15-mile swim in Lake Memphremagog. 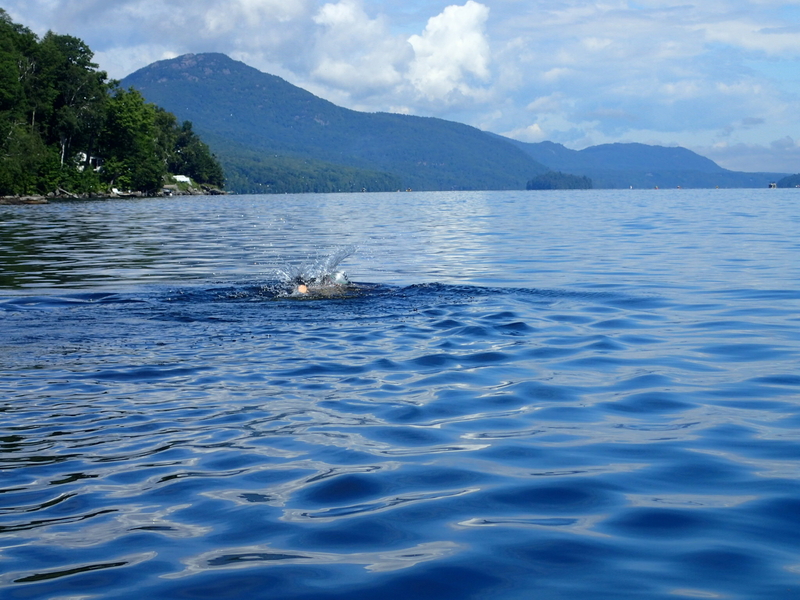 Starting in Newport Vermont, the Border Buster route took us North, to Canada, where we crossed the border, swam for a few miles, and then turned around to swim back to Newport. And yes, it was perhaps my shortest international trip ever. We drove to Newport the day before to big swim, and after gathering my goodies at race check-in, went directly to Jay Peak where we’d found a great place, kitchen included. I focused on preparation to distract myself from what would come the next day. I felt unusually nervous—although I might always feel that way and just don’t recognize it from race to race. For this swim, I tried something new as I have been feeling that I need more calories and carbs when I swim. 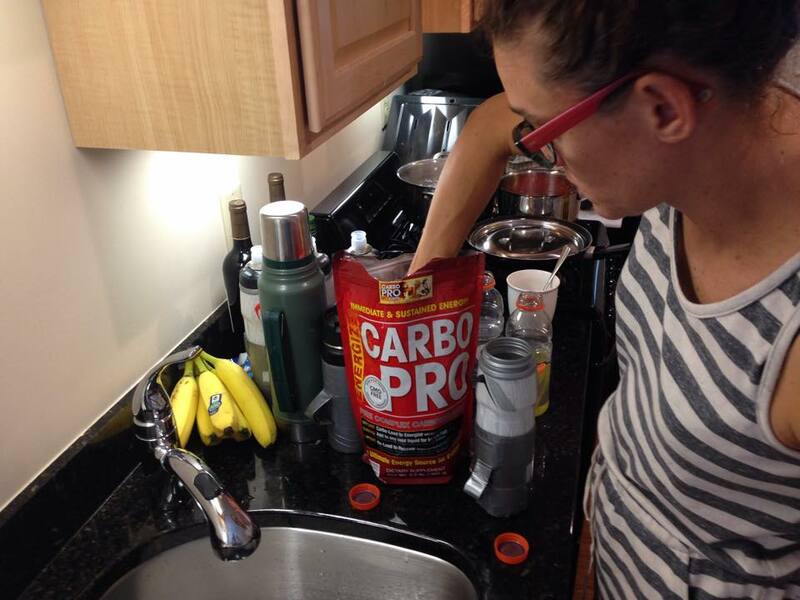 This time, it was a combo of Carbo Pro and Gatorade, to mask the taste and texture because I’m not great with drinks that feel thick when I’m trying to chug them on the swim. In practicing, I’ve found I can stomach this combo without feeling burpy or gross, and that it does tend to give me a little boost. Combine that with some chocolate GU and some Clif Shot Blox and so far, it’s proven to be a good combo. 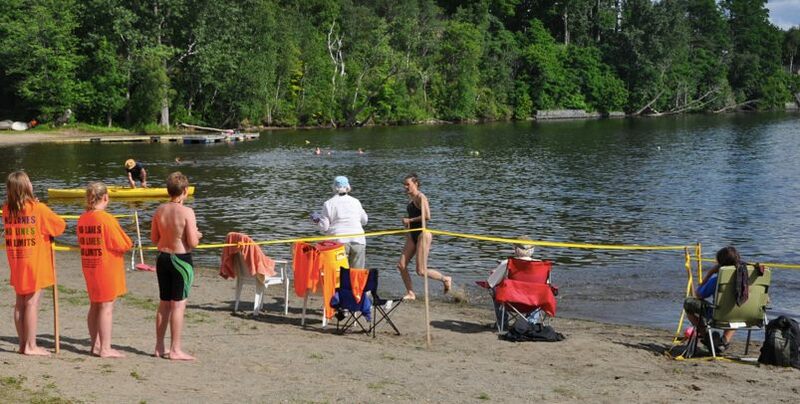 Pre-swim prep for me was all about trying not to stress about the water temperature. My constant fear in this swim life is that the water will be too cold, and yes, I know some say I should work more on my acclimatizing. It might sound wimpy, but I want my swims to actually be FUN and not just a sufferfest, so between that and my Raynaud’s, there’s only so cold I am willing to go. And I’m okay with that. 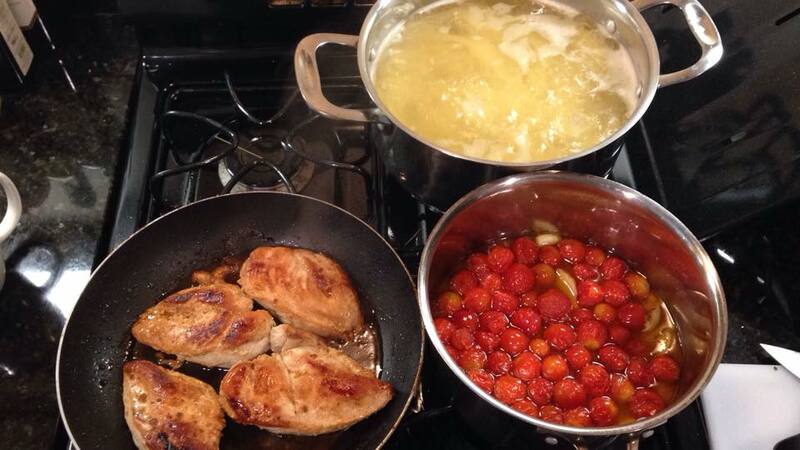 Pre-swim prep also means yummy eats. In addition to being my trusted kayaker and teammate, my husband also cooked me a great pre-swim dinner. What would I do without such a team?? Then, it was off to bed for a 3:30 wake-up for a scheduled race start at 5:30. Choking down my typical banana, tortilla, and peanut butter, we drove the 1/2 hour from Jay Peak to Newport. Yes, the fog was thick. And persistent. And threatened to stay put for much too long. 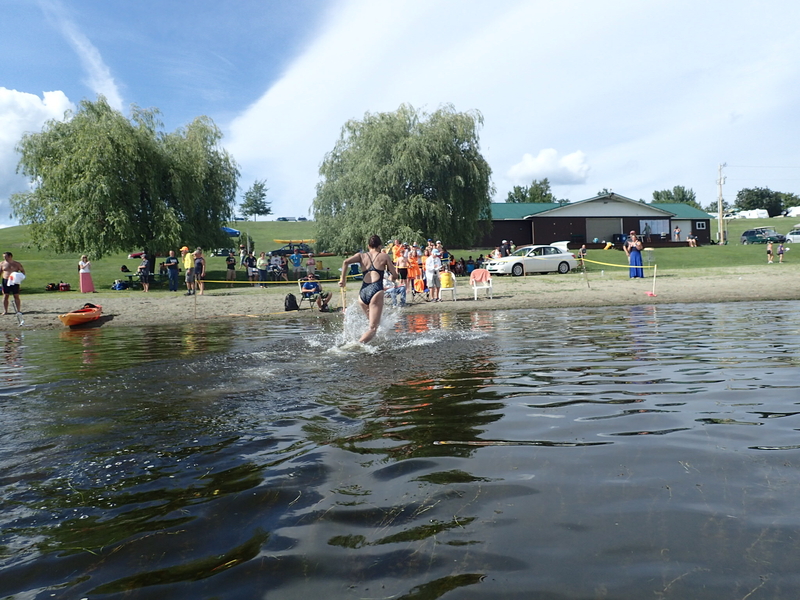 Open water swimming is a weather-dependent sport. Fog is there? You’re not swimming. 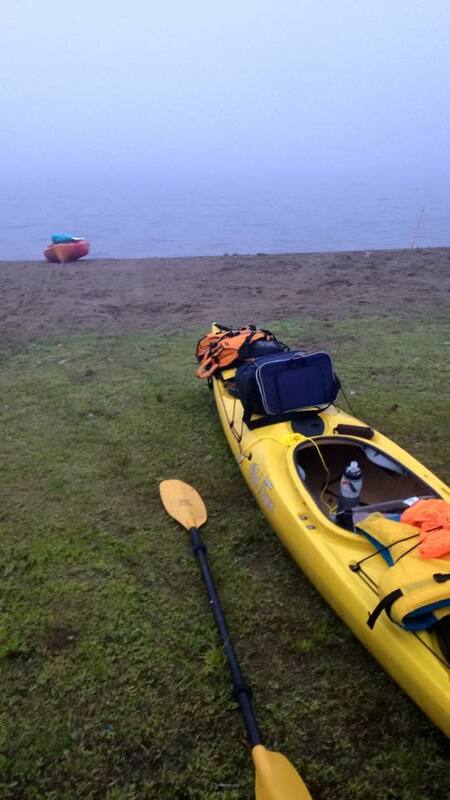 When you can’t even see the water, the kayakers and safety crew can’t see you, and neither of you can see the route. It’s part of the sport that is equal parts frustration and understanding because it’s the unpredictable nature of the open water that makes it so appealing. Swimmers doing the shorter distances, scheduled to start later in the day, began to arrive. 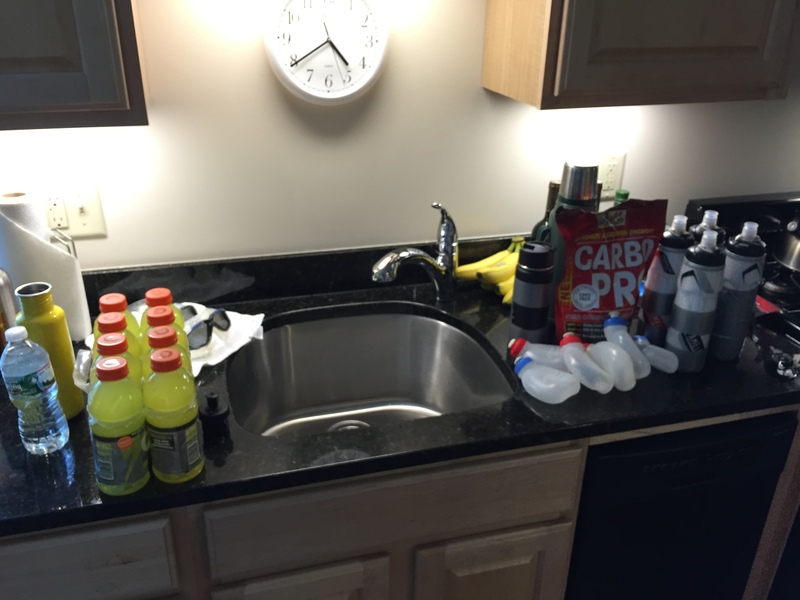 The 14 of us doing the 15-miler started to get hungry. We broke into our feeds, sucking down a GU or bar of some sort, recalculating when we might actually start and finish our swims, that 3:30 breakfast wearing off quickly. Kayakers got in the water, and then out again when it was clear we’d be waiting. And waiting. And waiting. 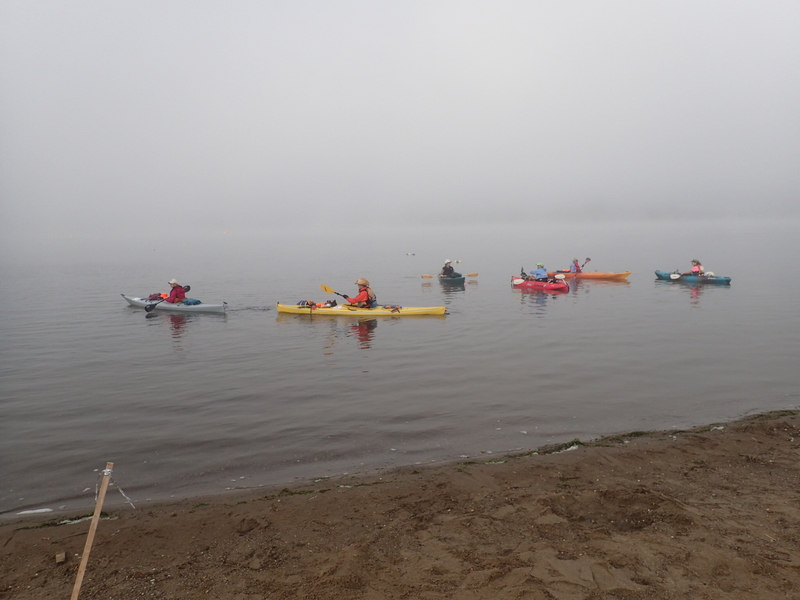 The fog would lift a bit, and then roll back in, and then lift on the other shore, allowing us a glimpse of a sun spotlighted buoy, and then roll in again. We’d get chilly, and then too warm, and then hungry again. We waited for news, with updates every 15-minutes or so, and the time slipped by. And we laughed about how maybe we should just bag it and go eat breakfast instead. Sun! Blue skies! Perfectly calm and beautiful water! 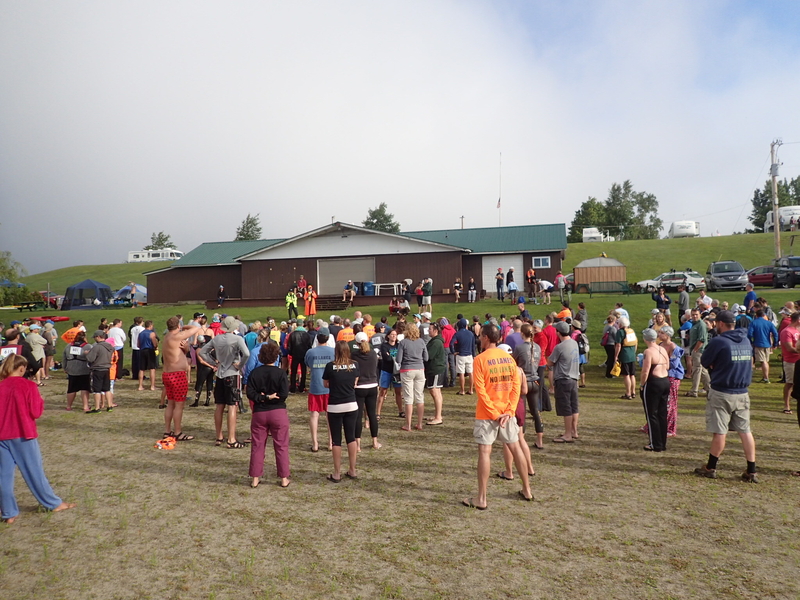 We gathered for final race safety meetings and our kayakers took to the water. As always, a word about how amazing our teams are. 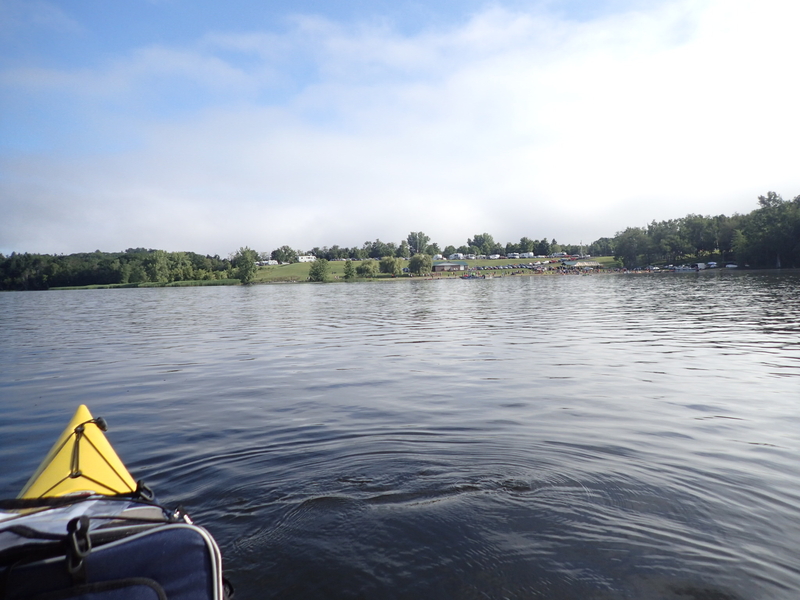 Acting as kayak support for an open water swimmer is a thankless task. A lot of work, and none of the glory. And then there’s the boredom! 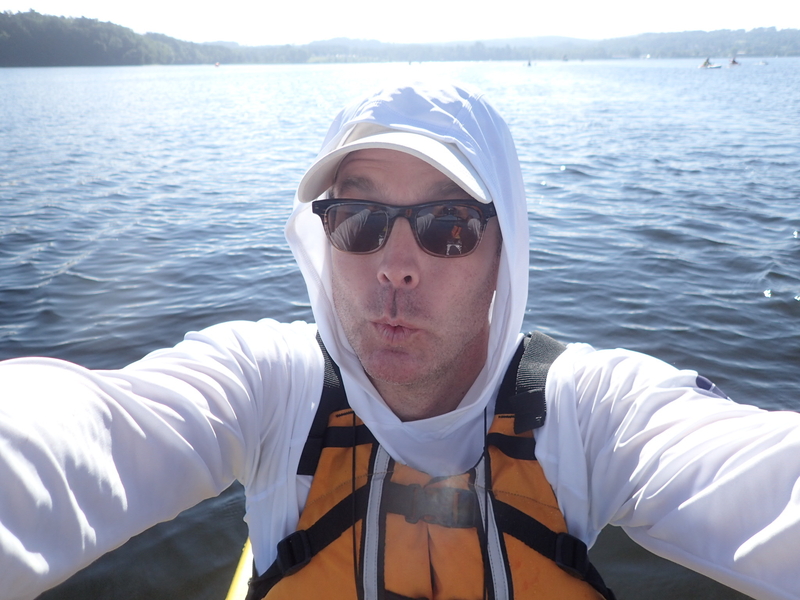 Yes, kayaking is fun, but kayaking at the pace of a swimmer is another story. It is, um, S…L….O…W. 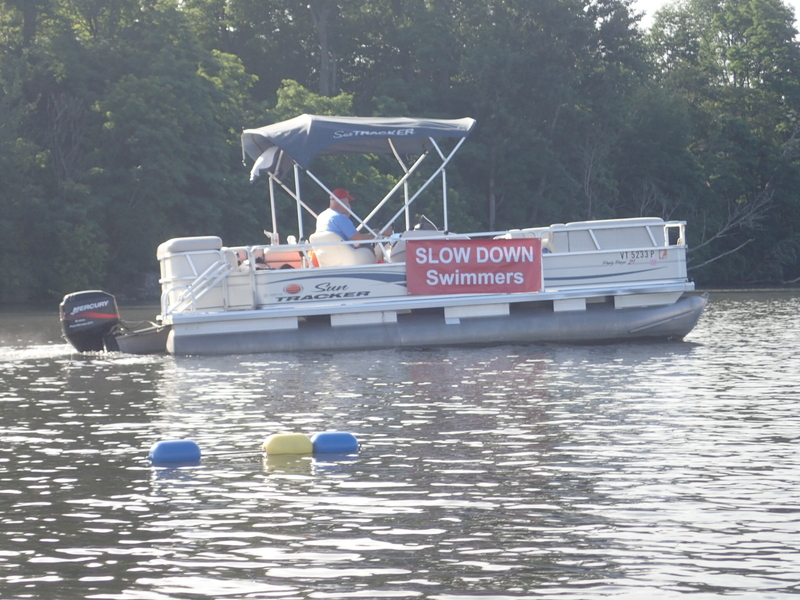 At least, when you swim at my pace it is. 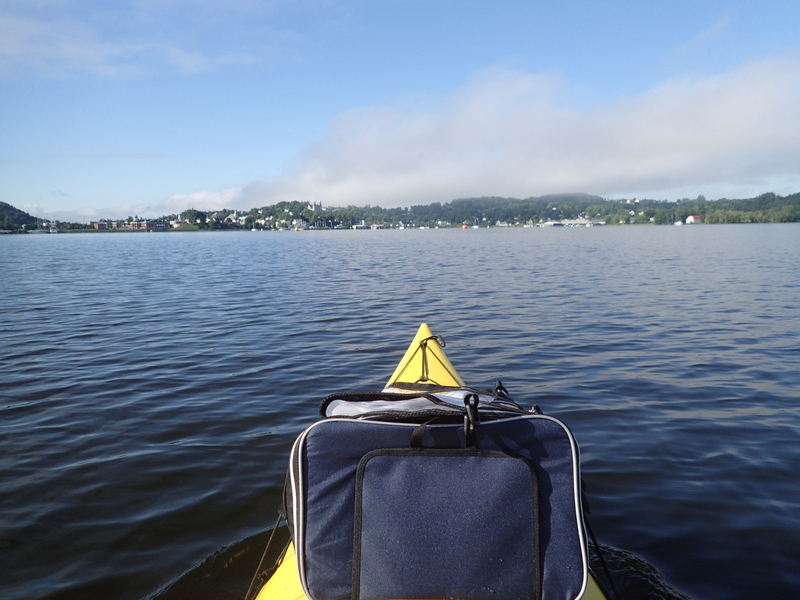 Kayaking also means managing the feeding schedule of your swimmer, monitoring their stroke rate, and often, being resigned to peeing in a bottle because you can’t get out of the boat. 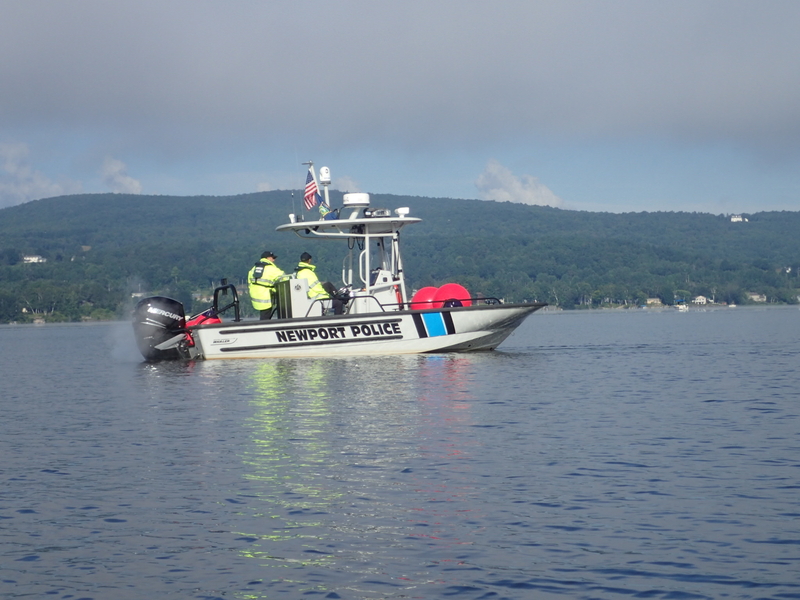 Kayakers confront the heat, or the cold, and they do it all because they want to keep us safe, fed, happy, and motivated. Despite all of it, look at how good-natured he remains!!! Amazing. Finally, it was time to swim. There’s not much to tell about the swimming part as this was, at least environmentally, one of the easier swims I have done. Calm and flat and beautiful. And I swam a bit more. 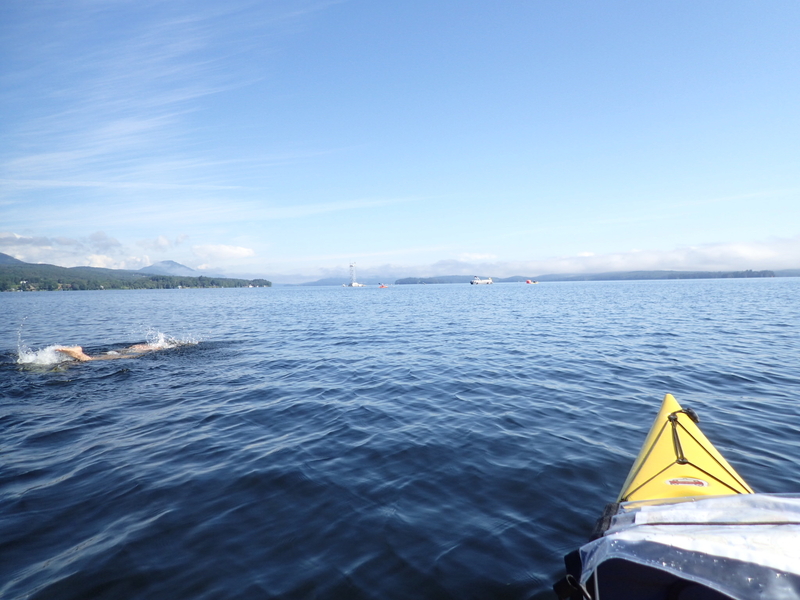 The support boats came to check on us approximately every 1/2 hour, judged me to be okay, and I kept swimming. Again, thank you to all who supported us and kept us safe out there! Before I knew it, we were in Canada! I kept swimming, and then, it was time to turn. Yeah, I’m a lefty when it comes to my directional abilities, something I work on constantly. Crossing the lake was endless, perhaps because making that turn feels like it should bring the end sooner than it actually does. But I still kept swimming. There’s a rhythm that comes when you are doing a swim of this distance, something intangible that defies explanation and that allows you to keep going and going and going. You’re not thinking about the other swimmers, for the most part, and that’s one of the thing I love about it. You’re just swimming, all for you. That said, this was the first swim in which John identified my, well, I guess boredom. The swim was beautiful, it was calm and flat and warm. But I am learning that I thrive on chop. And intensity. And the sense that I am competing against more than just my own force of will, which is strong. Am I, perhaps, a drama queen when it comes to swimming?!? Am I craving even more adventure? Perhaps. I kept swimming, soon crossing the border back into the United States. John monitored my stroke count and as I went, I got faster, picking up my stroke rate and feeding every 1/2 hour. I swam some more. Hours passed. Parts were difficult, and some parts felt as if I was flying through the water. Sometimes, I swam as if I was standing still. 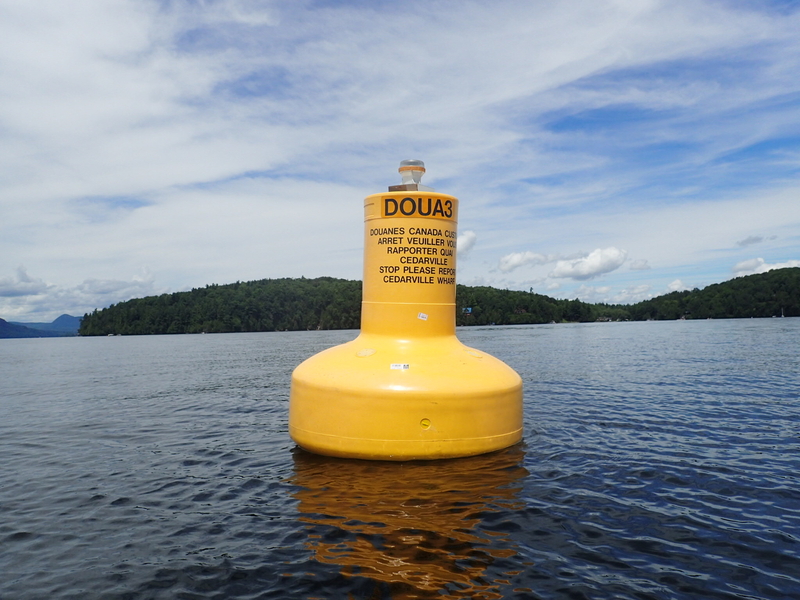 And then, the final turn buoy and the end was coming and I had done it. It was time to stand up and run out of the water. When a swim starts three hours late, there aren’t a lot of spectators left on the beach when you return, but I’m fine with that. In fact, I think I’d be okay with just John and I, ending at a beach, knowing what I had done and feeling satisfied with that being enough for me. No glory. No cheers. No medals. Just me, and the water, and John there with me. In this case, I ran out of the water and onto the beach, proud and happy and FINISHED! 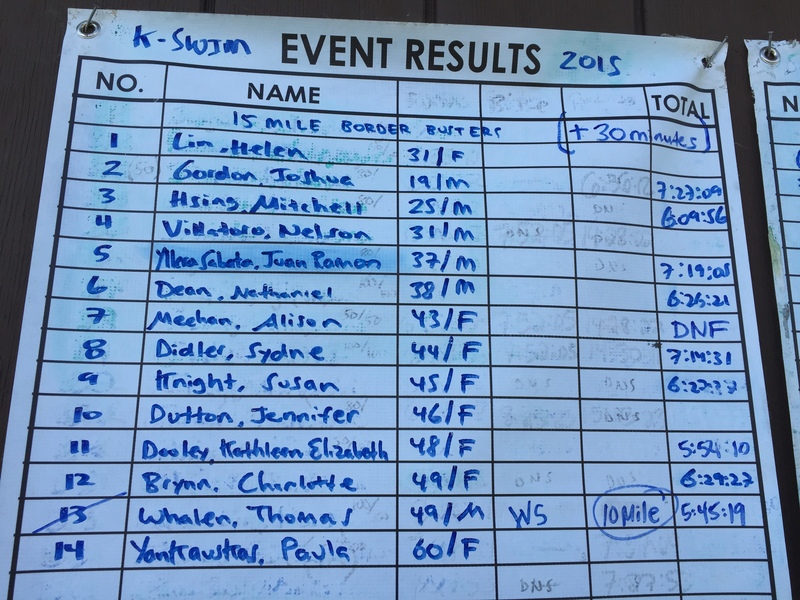 When it was all over, I’d finished in 7:44:31, less than 8 hours for what was over 15-miles of swimming, and 4th woman overall. Some of my amazing swim colleagues are just blisteringly fast and their abilities boggle my mind. For my end, I feel proud to even be able to do these things, and to be in such company is inspiring indeed. I am grateful for them, but also for all those who put in the hard work it takes to put together a swim like this. There is no glory in it, no big money waiting for anyone, and really, it’s just about the love of the sport. Thank you to all. After any swim, it’s time for the post-swim depression to seep in. I spend my time wondering what’s next, needing something to train for, and trying to figure out what else I can do this season, because as always, the season feels much too short. This time, I was left with a very special reminder of my day. 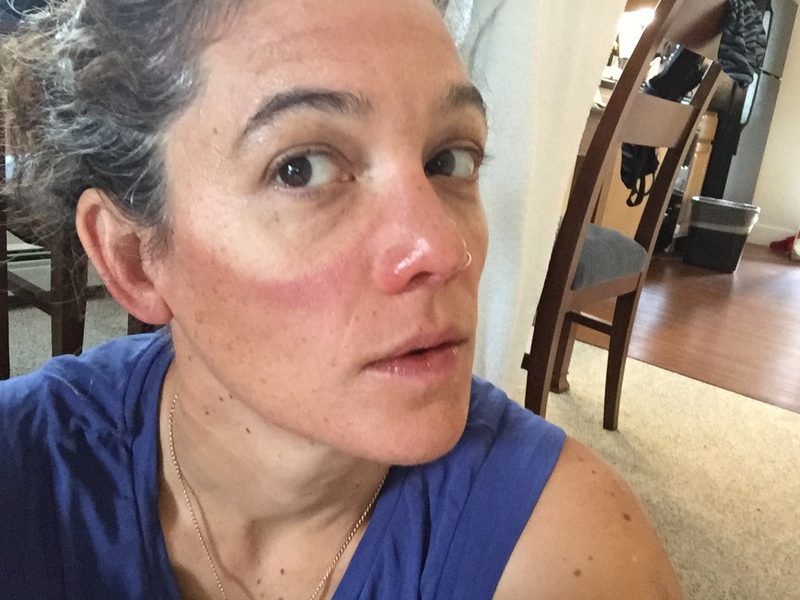 A swim may be over, but goggle face will always remain. Now, I’m focused on keeping those open water swim muscles active and thinking a lot about what shape I want this distance swimming thing to take as I continue. 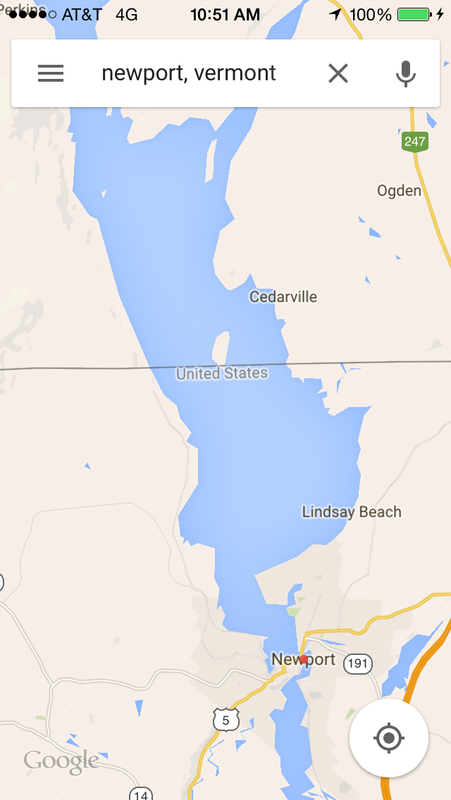 And of course, I’m still looking for that elusive 20-mile perfect swim, warm and salty, and just made for me. 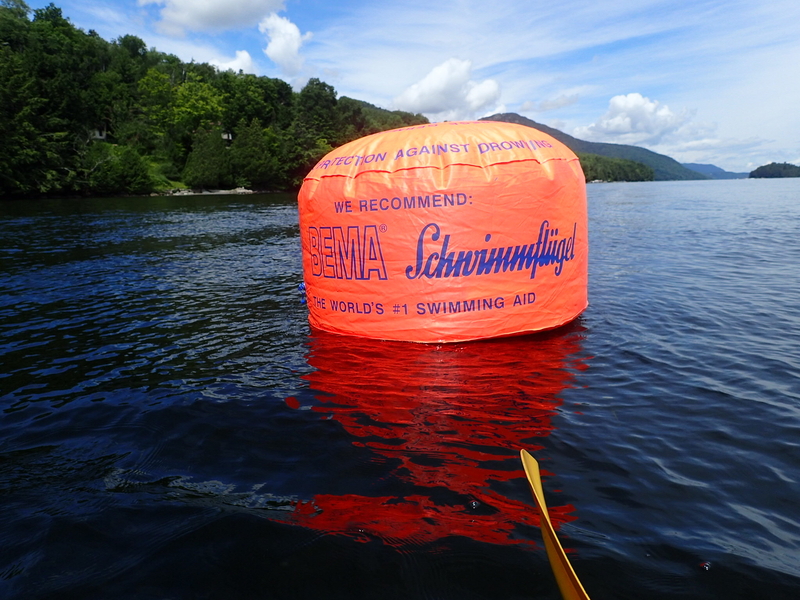 « Summer Swimming at Swimcrest is Simply Stupendous!